Who says that nobody plays the ukulele anymore? Well, technically, I’ve never heard anybody specifically say “nobody plays the ukulele anymore”, but you know what I mean. 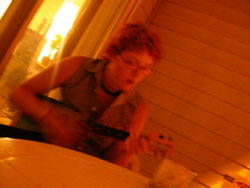 Ukebucket.com is a site showcasing Ukulele playing Indiana girl, Amber Nash. I will admit that I don’t listen to too many Ukulele tunes, but I do love music and I once downloaded several Ukulele albums from eMusic. If I were you, I would head on over to her site and check out her music section. Her version of Complicated may be the best rendition of an annoying pop song since Travis covered “…Baby One More Time” with acoustic guitars. The song Grama’s House is more guitar than Ukulele, but is very good and feels like a mix of Pink Floyd and something else I can’t put my finger on. Enjoy. Thanks one of my favorite daily reads, J-Walk Blog, for this one. "Ukebucket" by Jeremy Felt, unless otherwise expressly stated, is licensed under a CC BY-SA 4.0 International License.